Welcome to our monthly ‘CMH Guide’ for Classics! And welcome September! We’re hoping this classic movie and TV guide will help you plan some classic viewing fun… If we’re missing a classic channel, just let us know and we’ll be happy to add it! Star of the Month: DEAN MARTIN! From the early comedies, dramas, westerns, the Rat Pack years and more, “Dino” proved he was the enviable King of Cool who could do it all. Watch his selected filmography every Wednesday in September. AAFCA Presents, The Black Experience On Film (This month’s TCM Spotlight) every Tuesday and Thursday in September. From silents to the 70s, this collection explores a variety of films depicting the black experience in chronological order. Full schedule here. AFI Lifetime Achievement Award, airing Sept. 3rd Primetime: George Clooney. Sept. 10th Guest Programmer: Keith Carradine. Hollywood legacy and self admitted TCM addict, he sits down with Ben Mankiewicz to present an evening of his favorite classics. Saturday Evening Post Stories features The Big Heat, Friday Sept 7th at 8pm ET. The Ritz Brothers tribute on September 16th. A trio of 1930s films, 2 are TCM premieres, showcase this popular comedy team. Birthday Tribute: Roddy McDowall Sept. 17th (Daytime). 9/17 and 9/24: “Directed By Martin Scorsese” … For 2 nights, TCM will tribute the Director and regular TCM contributor with 7 of his films from the decade that made him a star. Contest: Our initial contest is over, but check back because we’ll be launching a new contest soon! Featured Collections: The films of Paul Newman, Cary Grant, Frank Sinatra, Lana Turner, Max von Sydow and more! A mix of classics and newer films can be found in the Movies TV Network schedule (which also includes more recent films). Check out the Sunday Night Noir every week! Here’s Where to Watch. You can stream lots of classic TV shows for free (and on demand) here including the complete MeTV schedule and Where to watch. The Antenna TV schedule includes a nice listing of shows and their air times (easier to read) and Where to Watch. The Decades TV schedule with a list of the TV shows and Where to Watch. Check back on this blog for more Ticket Giveaways! 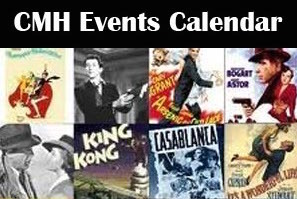 Classic Films on the big screen, Film Festivals and more can be found across the country. 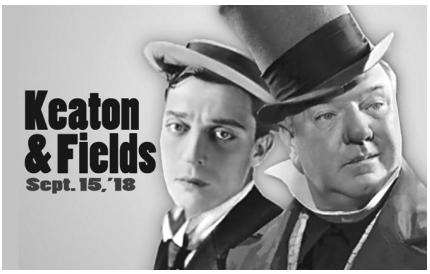 For example, Enjoy the 25th annual Buster Keaton special event in Kansas City: The Legacy of Buster Keaton and WC Fields, taking place September 15th~ All-day Silent Screenings with Live Music and FREE ADMISSION! 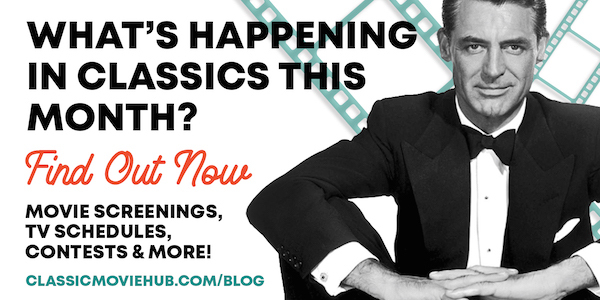 If we’re missing a ‘classic movie’ theater or event in your neighborhood, please let us know! Kino Lorber DVDs and Blu-Rays — 12 prizes in all, winner’s choice of four titles – Trapeze, The Farmer’s Daughter, A Strange Adventure, and I Walk Alone. Check back on this Blog on Sept 10 for details. FilmStruck Annual Subscriptions — we have more subscriptions to give away! Check back on this blog on Sept 17! This entry was posted in Posts by Annmarie Gatti, What's Happening in Classics and tagged classic movie events sept 2018, classic movies september 2018. Bookmark the permalink. Pluto seems promising. I’m still exploring it.